This letter was written by Lt. Otto Heinrich Sollau (1842-19o5) of Co. F, 3rd Indiana Infantry. Otto’s military records are most commonly found as Sollan although there are other variations as well. Otto was the oldest son of Johann Albert Sollau (1807-1878) and Anna Barbara Sauring (1815-1869) who came to the United States from Germany in the early 1830s. His siblings included, John Ludewig Sollau (1843-1864), Albert Herman Sollau (1844-1892), Maria Anna Sollau (1847-1849), Wilhelm Ferdemart Sollau (b. 1849), Louisa Anna Sollau (1851-1931), George Bernhart Sollau (1852-1930), Christian F. Sollau (1854-1895), Ann Tharasa Sollau (1856-1918), and Catharine Magdeline Sollau (1858-1940). 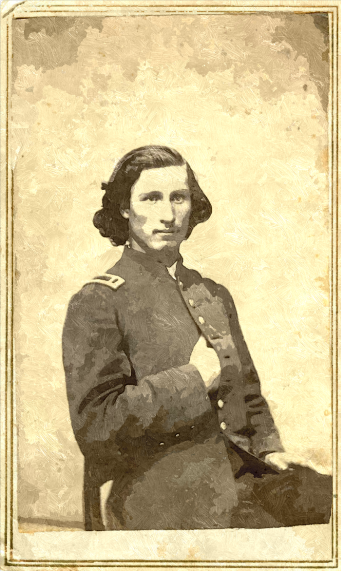 Otto’s parents resided in Stark County, Ohio in 1860 but Otto gave his residence as Plymouth, Indiana, when he enlisted in Company C. He received his commission as First Lieutenant in Co. F on 26 July 1864. Otto’s brother, John L. Sollau, also served in the Union Army during the Civil War. He was a private in Co. A, 19th Ohio Infantry [but died while on volunteer detached service with the 104th Ohio?]. After the war, Otto worked as a carpenter in Milwaukee (1870), as a picture frame manufacturer in Fort Wayne, Indiana, (1880), and as a scrawl sawyer in Grand Rapids, Michigan (1893). Pension records indicate he died in Kalamazoo, Michigan on 15 January 1905. He was divorced in the 1870s. Old Soldier Dead. Otto H. Sollau who was brought here from Soldiers’ Home Last August. Otto H. Sollau, an old veteran, brought here from the Soldier’s Home at Grand Rapids, last August, died Monday night in the asylum hospital, from a stoke of apoplexy. He was 64 years of age, and had been bed-ridden throughout the five months of his stay. Nothing is known here regarding his past life. The remains, accompanied by relatives, will be taken to Grand Rapids today for interment in Soldiers’ Home Cemetery. The men of the 73rd Indiana Regiment were first to attack in the Battle of Stones River at Murfreesboro. They lost a third of their men in that fight alone. This letter was written from Larkinsville, Alabama, where the 73rd Indiana was headquartered while guarding the Mobile and Charleston Railroad. Our mail has finally come through this morning and I had the pleasure of receiving your short letter. And since you still think of me, so much as to write to me, I will not delay this answer. I am glad to hear that you are all well at home. I had glad also, that I can say as much, for myself. I have enjoyed very good health since I have been here. We heard the news of the taking of Richmond and the capture of Gen[era]l Lee and his army, as soon as the telegraph could bring it here. We fired 200 guns at this post in honor of the great victories. But alas! Our joys were turned into sorrows for on the next day we received the news of the shocking murder of our president. Yesterday was set apart for a day of mourning. all business was closed up and the flag floated at half mast. I have no photographs of myself now – and cannot therefore send you one, but as soon as I can get to Huntsville to get some taken I will send one. I expect to be at home before a great while, and then you can see me and won’t need a photograph. however, I will send one anyhow if I get any. I must close my letter for this time. Write again. Your letter of the 30th of April has arrived. I was much pleased to hear from you. How old are you? You do first rate at letter writing, but you must still try to improve some on your penmanship. You must be a pretty big boy already to go to the secondary. What do you study? This is a very pretty Sunday morning. I suppose you go to church and to Sunday School. I would like to be back North where I could hear the bells ringing for church again. We spend the Sunday different here. In the morning at daylight the drummer beat what is called “reveille.” Then all the soldiers go out in front of their tents or barracks and answer to roll call as you do in school. They then clean up their quarters, black their boots, and brush up their uniforms for inspection at 10 o’clock. They they get their breakfast and wait till 10 o’clock. After company inspection, the boys have nothing else to do on Sundays. Then they get passes to go out in the country. Frequently they get chased in by the guerrillas. People would think it awful to hear the drums beat on Sunday, wouldn’t they? When I get home I will tell you a good many things about the army and this country that you don’t now understand. I will close for this time. I have written a pretty long letter and I have a few more to write so you must excuse me. Write soon. This entry was posted on Sunday, November 30th, 2014 at 3:24 pm	and posted in Uncategorized. You can follow any responses to this entry through the RSS 2.0 feed.